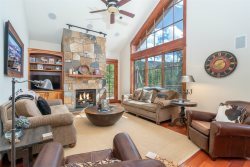 With scenic sightlines of the San Juans and expansive panoramas of the Wilson Mountains, it won’t take you long to realize that it’s all about the views at 245 Country Club. Rock, wood, and leather interiors complement the natural beauty pouring in through from every window. Enjoy dinner al fresco at the outdoor dining table as Arnold Bax’s “A Mountain Mood” plays softly through the SONOS home audio system. You won’t need a sommelier to tell you that sunset vistas like these pair nicely with almost any of the varietals you have in your dedicated wine fridge. Trust us when we say you’ll want to stay forever. And if you do, you’ll need groceries, lots of them. Which is why it so handy that the gourmet kitchen at 245 Country Club makes it easy to stock up with a grocery pass-through directly from the garage. It might not be exactly farm to table, but Range Rover to range is good enough for us. Located in Mountain Village, Country Club D is a luxurious, multi-level townhome with custom finishes throughout and expansive views of the San Juans.